Does Quacker and Kelloggs UK products contain the carcinogen? Can spraying Roundup in your garden put you at risk? Glyphosate is currently one of the most argued about products that the world’s biggest biotech company, Monsanto; sells and distributes across the globe. They go to extraordinary lengths to ensure their products are cleared of any charges of causing harm to biological life, including that of humans. But, their practices of suing everyone and every country that investigates their products and funding their own scientific research which always clears their products; is akin to the action of the Tobacco Industry throughout the 1950s in covering up that smoking causes cancer. Here, the Environmental Working Group, a pressure group within the USA, reports on the findings of a new analysis from the peer-reviewed scientific journal Environmental Sciences Europe which documents the diametrically different approaches the U.S. Environmental Protection Agency and the World Health Organization took when determining the cancer risk from exposure to Monsanto’s weed killer glyphosate. More than 225,000 people have signed a petition from EWG and Just Label It calling on General Mills, Quaker and Kellogg’s to get glyphosate out of their products. EWG and a number of food and nutrition companies have petitioned the EPA to sharply limit glyphosate residues allowed on oats and prohibit its use as a pre-harvest drying agent. Companies signing the petition include MegaFood, Ben & Jerry’s, Stonyfield Farm, MOM’s Organic Market, Nature’s Path, One Degree Organic Foods, Happy Family Organics, Patagonia, PCC Community Markets and Amy’s Kitchen. British consumers, may be well placed to note the products imported from the USA that contain glyphosate in food! But it is not just in food, it is also a possible risk to those who use the likes of Roundup as a weed killer in their gardens! 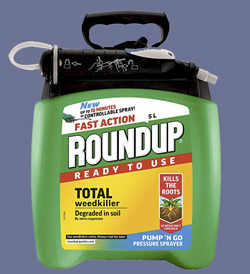 Roundup is Glyphosate in it's most common form in consumer products used in the gardens length and breadth of the UK. Recent regulatory judgements on glyphosate cancer risk in the US and Europe are based upon an assessment of general population, dietary exposures under typical conditions, and do not take into account, nor reflect a detailed evaluation of the sometimes much-higher levels of exposure that occur in a variety of occupational mixer/loader and applicator scenarios e.g. hand-held, backpack, ATV, and truck-mounted sprayers that require a person to hold and direct an application wand. Such applications lead to much higher dermal exposures compared to applicators working inside tractor or sprayer cabs. In addition, applying a GBH many days per year for several hours per day inevitably leads to greater, routine dermal exposures, as well as more numerous incidents during which significantly greater than normal exposures occur because of a leaky hose or value, wind conditions, a spill, or other unusual or unforeseen circumstance.